Although water is a calorie-free beverage without much taste or nutritive value, it has tremendous positive properties for weight loss and health. Along with keeping you hydrated and ensuring that the systems in your body run smoothly, water might have the potential to act as a natural appetite suppressant. However, to lose weight, you must reduce the total number of calories you eat, and water can’t do that task alone. Drinking water before meals might help curb your total calorie consumption and physically fill your stomach. According to a 2010 study from Virginia Tech nutrition professor Brenda Davy, participants who drank two glasses of water prior to eating meals ate close to 100 fewer calories at each meal and lost about 5 lbs. more over a 12-week period than subjects who did not drink water prior to eating. Researchers are not positive of how water works to aid weight loss. In addition to acting as a filler, it might encourage you to be more active by boosting your metabolism. 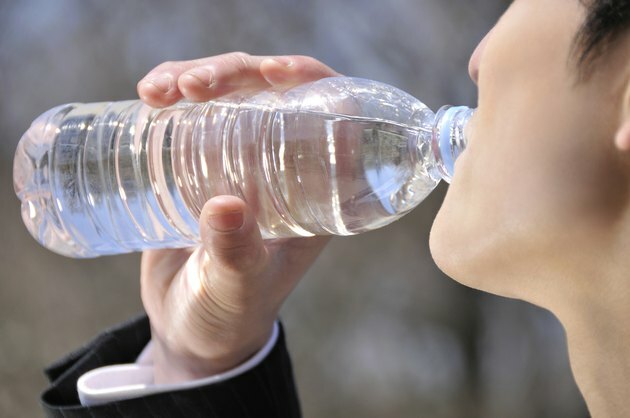 CNN.com physician nutrition specialist Dr. Melina Jampolis notes that being even mildly dehydrated can significantly slow your metabolism, so drinking enough water is especially important if you want to slim down. While water is calorie- and fat-free, junk food definitely is not. Thus, if you supplement your diet with a lot of “empty calories,” even drinking large amounts of water won’t be able to help you lose weight. According to the USDA, a single chocolate peanut butter candy bar has 275 calories, 13 g fat and 30 g sugar. Eating a quarter of an 8 oz. bag of potato chips will set you back 310 calories and 20 g fat, and having a hot fudge sundae comes with at least 285 calories and 8.5 g fat. Junk foods also contain high amounts of sodium and cholesterol, which can increase your risk of high blood pressure. It is possible to lose weight while including some junk food in your eating plan. As long as you are able to build up a calorie deficit by eating fewer calories than you burn on a consistent basis, you can have occasional treats or indulgences and still notice positive results. However, your calorie totals will be bringing those results instead of the water you drink. Before you start any new weight loss plan, speak with your doctor and get approval.